• The Republican National Committee has officially severed ties to NBC News after the Repubs were unhappy with the tone of the October debate hosted by CNBC. • Flint, Michigan continues to struggle with undrinkable water, but have no fear - Cher is donating 180,000 bottles of water to help residents. Your move, Gov. Snyder. • Sen. Mark Kirk of Illinois becomes the first Republican sponsor of The Equality Act in the U.S. Senate. • Donald Trump admits to having virulently anti-gay Tony Perkins help write his speeches for him. • Apparently, an intoxicated gun-nut "dropped" his gun during a screening of “13 Hours: The Secret Soldiers of Benghazi" and shot another movie-goer, and then left before anyone could identify him. • The snow storm bearing down on the Eastern United States has cause over 5,100 flights to be cancelled. • Rev. 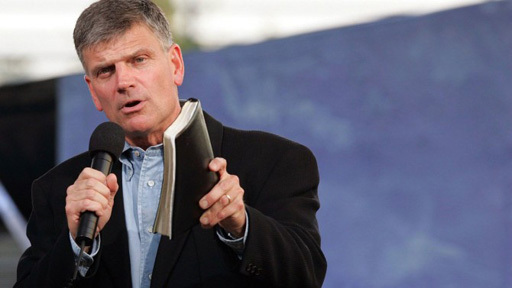 Franklin Graham says gay Christians are "the enemy."